World 6-5 is the fifth level of World 6 in Super Mario 3D Land. This snow level can be unlocked with sixty Star Medals. Mario starts in a snow platform with flowers. Going ahead, he must jump to the top of a high cliff using a bouncy platform. There are a Paragoomba and another bouncy platform, now in a short rail. Using it, Mario must go to another giant ice block structure, where a small Goomba Tower is found. Passing these Goombas, Mario must ride a bouncy platforms in rails, crossing Goombas, Brick Blocks and icy walls. Then, he must jump to a big ice platform, where the Checkpoint Flag can be touched. Going to the right, the plumber sees three bouncy boards to reach on the other side of an icy wall, where are more bouncy platforms and a Red Ring. 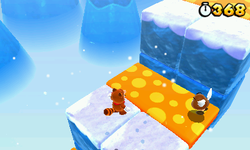 Above a high cliff, he will face Goomba Towers until ride a rail bouncy board, using also wood walls, Donut Blocks and stationary orange platforms. Mario will see a pass between two ice block walls. There are the three last bouncy platforms, used to reach on the Goal Pole. Star Medal 1: After the first moving platform, there is an ice platform with three brick blocks; the first medal is on the bottom of this platform. The player should use the moving platform they just used to bounce and get it. Star Medal 2: While moving along the third moving platform, the player should come across a pair of wooden walls. Wall jumping along these will take them to the second medal. Star Medal 3: Near the end of the level, the player must jump on the bouncy platform directly above this medal and drop down into it to grab it. This page was last edited on April 9, 2019, at 00:23.